The next production by the St. Scholastica Theatre will feature a script based on the critically acclaimed novel by John R. Powers, "Do Black Patent Leather Shoes Really Reflect Up?" The play premieres at 7:30 p.m. Friday, Nov. 2, in the St. Scholastica Theatre building, behind Tower Hall on campus. Additional evening performances will be at 7:30 p.m. on Nov. 3, Nov. 8-10, and Nov. 15-17. Sunday matinee performances are scheduled for 2 p.m. Nov. 4, Nov. 11 and Nov. 18. 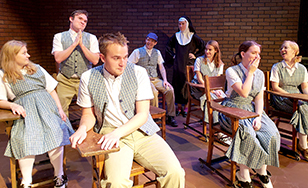 The musical tells the story of eight Catholic school children through elementary and high school. In a series of vignettes, the story follows them from first confession through the senior prom as they wrestle with questions of faith, adolescence, love, and the gift of a vocation. The production of "Do Black Patent Leather Shoes Really Reflect Up?" is directed by Merry Renn Vaughan, associate professor and chair of the Communications, Theatre and Art Department. "Whether or not you are Catholic, the musical is a fun look back at growing up Catholic in the 1950s and '60s," Vaughan said. "It's a simpler time and place. There is fun and nostalgia." Tickets are $15 for adults and $10 for seniors/students. Contact the box office at 218-723-7000 or visit spotlight.css.edu.